It's been a while since I wrote my first post on my Pixel Project. A lot has changed from my original design idea and intent for this project. This tends to be the way I work. I start out with one idea, and it morphs over the course of months to something completely different. As I mentioned in my last Pixel Project post, here was my inspiration photo. I was inspired by the bright colors against the neutral background. 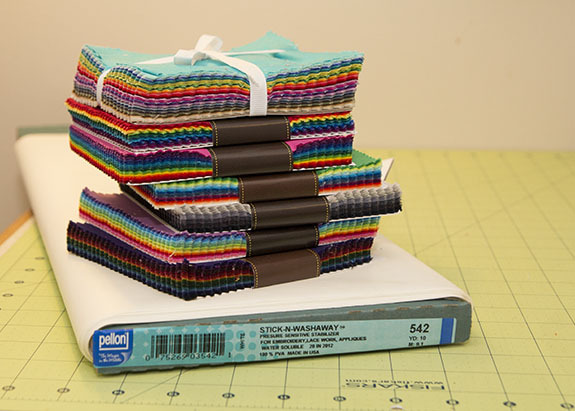 I'm designing this project with 1" finished squares. Charm packs are perfect for pixel projects. Since I'm cutting 1.5" squares to sew, I can get nine from each charm. Using these charm packs gives me great variation in color. 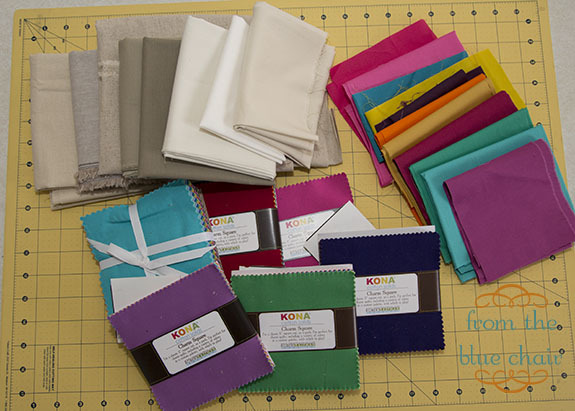 I chose my fabrics from seven different Kona charm packs I picked up Quilt Market Sample Spree last fall. I also bought a Michael Miller Cotton Couture charm pack that includes one of each color from that line. Pellon kindly sent me a bolt of Stick-N-Washaway to try out for this project. I'll be talking more about the pros and cons of the product in a later post. I pulled in some Pure Elements from my stash as well as several neutrals. 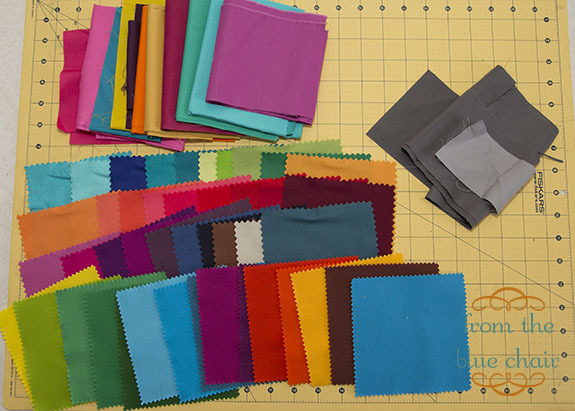 I started selecting my fabrics from these piles. This is what made the cut from my colored solids. For the most part, I was looking for very saturated, bold colors. I threw in a few lighter colors for variation, but most of the softer tones will come from the neutrals. Then it was time to cut. I used a brand new rotary blade and went to work. When the pieces are this small, it takes more care to get precise cuts. I cut a lot of little squares, but this is just a beginning. 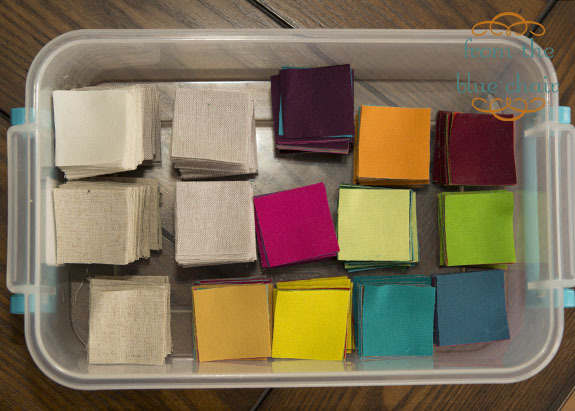 I know I'll be cutting many more 1.5" squares from my neutrals, but this gives me a good start. I love all the little stacks. Now to start sewing! On a side-note, it's the last day for the Craftsy Spring Sale. Nearly all classes are on sale today. I signed up for the Artisan Bread Making class and Leah Day's Free Motion Quilting Sampler class which have both been on my list for a while. I'll let you know how they go once I get a chance to work through those videos! Love what you do with bright colors!! Can't wait to see where this goes... Enjoy! 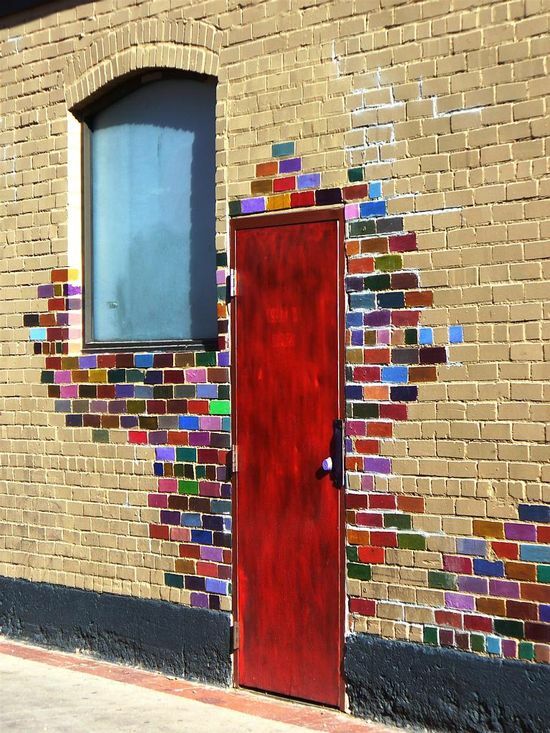 This will be amazing - love all the bright colours! Looking forward to following progress on this quilt. I do understand what you mean about an idea changing in your head as it takes shape. That is the sign of a creative mind! Love those little square stacks. You brave soul to work with such small squares! I'm excited to see how it progresses. Ooooooh! You'll love Leah's class! Mmm all those colors... Swoooon.